This is my first book by David Bell. After seeing the beautiful cover and reading the blurb, I couldn't wait to request it. 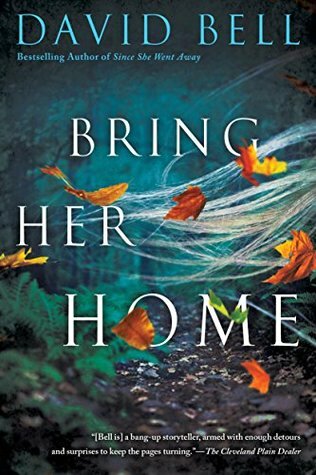 Bring Her Home is narrated through the eyes of Bill Price, a broken-hearted father after his teenage daughter Summer goes missing. He's devastated especially since just over a year ago he lost his wife in an accident. Neither Summer nor Bill has processed their loss well and they are still grieving. Before Summer's disappearance, her relationship with Bill had been difficult. Summer has begun testing her boundaries and questioning Bill's authority repeatedly. Summer and her friend Haley are found at the park two days later. Haley is dead and Summer has been beaten to within an inch of her life. Bill leaves everything behind to stay at the hospital with his daughter. Bill's sister Paige comes to stay with him and give him the support he needs. The police have no good leads but Bill believes Summer is still in danger and he will do anything to protect her. And here is where I stop....It's hard to say more without giving the plot away. I can say that it has two good twists I enjoyed. Now, to the main issue I had with the story. My main problem was with Bill. I liked him for the most part. I could feel his desperation to help Summer in any way he could. However, he also made several hasty decisions and if anyone needed anger management counseling ASAP, it was him. Anything made him explode. His behavior was irrational. I'm not saying that his grief and pain was not affecting his judgment but some of the situations he placed himself in were just dumb. I'm surprised Detective Hawkins, didn't throw him in jail multiple times. Overall, Bring Her Home had a suspenseful narrative that kept me guessing of what was to come until the end.